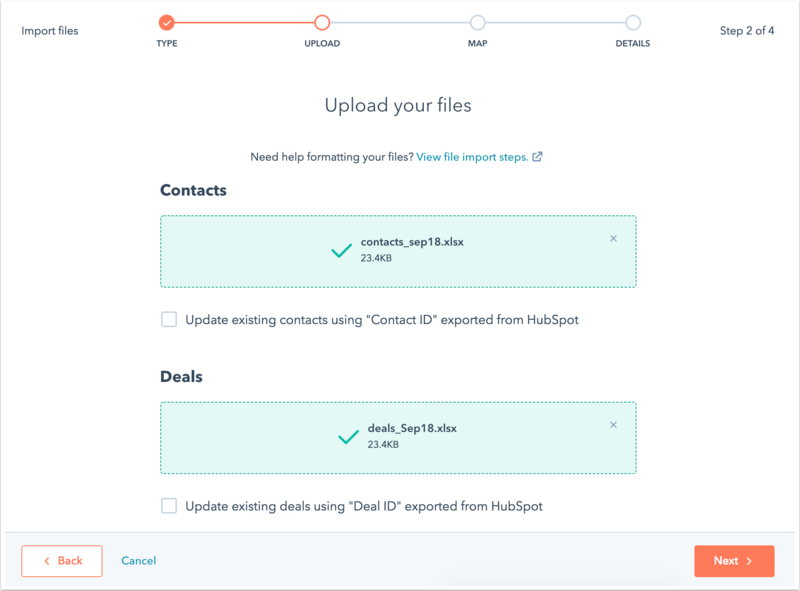 When importing records into HubSpot, you can create associations between two different record types by uploading a spreadsheet for each. You can also import notes in one file to be associated to the records in the other file. To associate records via import, set up an import file for each record type and include a common field in both to uniquely identify the records you want to associate. Create two spreadsheets, one for contacts and one for deals. On your deal spreadsheet, give a unique ID number for each deal in the "Deal ID" column. If your deals already exist in HubSpot, and you want the import to overwrite values for the existing deals rather than create new deals, use the object ID from HubSpot as the unique identifier in the "Deal ID" column. On your contacts spreadsheet, include the ID of the deal you want to associate a contact with in the "Deal ID" column. Please note: if you upload files for existing contacts with email addresses or companies with company domain names, any existing information will be overwritten by new values you’ve imported. 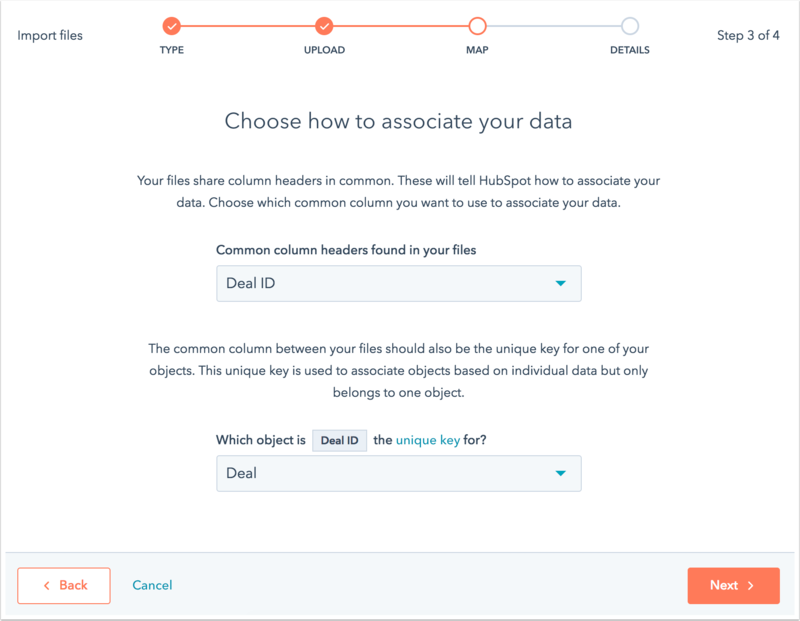 Learn how HubSpot deduplicates records. Select File from computer, then click Next. Select Multiple objects with associations, then click Next. Select the two objects to associate via import, then click Next. Upload each of your record type spreadsheets into the corresponding section. If you are using object ID to deduplicate either or both of your files, check the corresponding Update existing [object type] using "Object ID" exported from HubSpot box. Click Next. Click the Common column headers found in your files dropdown menu and select the column header for the field used as the association identifier in both of your spreadsheets. Click the Which object is [header] the unique key for? dropdown menu, and select the object type that this field is the unique identifier for (i.e., each row in the spreadsheet for this record type has a unique value for this field). Then, click Next. Review and confirm your selection. Then, click Next. HubSpot will automatically match the columns in your file to your properties in HubSpot. If any columns do not match an existing property, click the corresponding dropdown menu, then select an existing property, or click Create new property to set up a new property to which this column will be mapped. Once you've mapped the columns in your files to properties in HubSpot, click Next. Please note: if you're importing contacts or companies with the object ID the Email or Company domain name property will not be mapped. Enter a name for your import. If the EU General Data Protection Regulation (GDPR) setting is enabled in your account and you're importing contacts, you will need to enter a legal basis for processing your contacts' data.